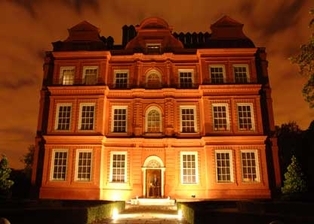 This four story redbrick house built by a prosperous Flemish merchant in 1631 on the site of an earlier Elizabethan house, is the smallest and sole surviving of more grandiose royal Thames-side residences at Kew from a time when the river was the sovereign's royal highway connecting a string of palaces stretching from Greenwich Palace in the east to upstream Windsor Castle, with the Tower of London, Whitehall, St. James's, Westminster and Hampton Court Palaces in between. Cozy rather than stately, Kew Palace was originally purchased by George II and Caroline his Queen in 1729 as a lodge for their three eldest daughters, and first as an annex to the family's statelier White House and later, from 1801, as a semi-permanent country retreat, while King George III busied himself with demolishing the White House and building a faux gothic castellated palace next door. George III, who suffered periodic attacks of porphyria and related madness, never completed his gothic 'dreamcastle' next door and it was blown up in 1828. A contemporary account describes what we have been spared by this, perhaps, friendly act of demolition:- As a record of this degeneracy, near the western corner of Kew Green stands the palace, commenced for George III., under the direction of the late James Wyatt, Esq. ......this Anglo-Teutonic, castellated, gothic structure must be considered as an abortive production, at once illustrative of bad taste and defective judgment. We are fortunate that Kew Palace did not suffer a similar pyrotechnic fate. New beautifully restored and furnished in the elegant Georgian style that we now see. It is a gem of understated taste that fitted ill with later Victorian imperialism and Edwardian flamboyance and was allowed to fall into disrepair until most beautifully and painstakingly restored by the Royal Collection under the direction of Prince Charles in 2006. This year the Royal Kitchens next door are opened after extensive restoration to evoke the year 1798 Special Sunday evening guided tours with wine and refreshments are available until 23 September. Advance booking only for this facility. Check for details and tour bookings. �A special themed 'Georgian Dinner' is served once a month in the King's Dining Room. For details and dates check Georgian Dinners. 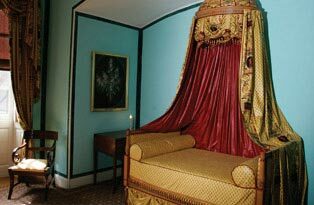 You can also hire the King's Dining Room, used by George III and his family, (and more recently by Her Majesty, The Queen), for you own private reception or dinner with catering by Mosimanns, Royal Warrant caterers to The Prince of Wales. Access: 10am-5pm, April - end September. Tickets: �5.30 (Concessions) plus admission ticket to�Kew Gardens, price �13.90, (concessions).� Purchase both at Kew Gardens entrance. The Gardens are open from 9.30am throughout the year. Summer closing time: 6.30pm. Transport: Nearest Tube. Kew Gardens. Car park at Thames-side Brentford Gate �6. �Download Visitor Information Map, recommended. If you have a question, contact us and we will do our best to provide answers.